Ok I know have a weird fixation on hair rumors. I already tackled the Marie Antoinette going grey overnight rumor. Now I have to address the Mary Queen of Scots being bald rumor. 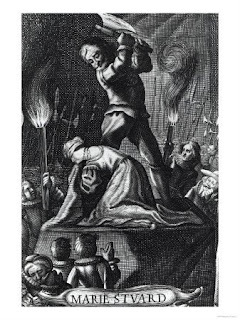 The Rumor: When Mary Queen of Scots’ executioner held up her head in the customary "God Save the Queen" mumbo jumbo, the poor sot was left holding only a wig as her head rolled to the ground. Everyone was then very shocked. Not shocked that Mary was missing a head. Oh no. Shocked that Mary kept a dirty secret….she was as bald as a newborn. The Truth: Yes, Mary was probably losing her hair due to numerous health problems. But her real dirty secret was that she had gone grey…not bald. At her execution, she wore her customary auburn wig and eyewitnesses were surprised to discover Mary’s natural hair color. Her hair was cut short too which may have also lent some credence to the baldness rumor. I know debunking this rumor is not going to change the world. But come on…the poor woman lost her head. At least, let her keep her hair. (1) I am not going to name the bad trivia book because I believe in book Karma. I too may get some historical fact seriously wrong some day and get it into print. Thanks for clearing up that rumor. I've heard it more than once over the years.